I admit to tinkering – doubling the vegetables, adding carrots & sometimes using combination of turkey & beef. Now and then, I’ll cut back on the meat and toss in a little cooked quinoa about halfway through the cooking process. I often use less sugar than called for – the grated carrot melts in to the dish and adds its own sweetness. Don’t tinker with the ground mustard – it’s what makes this recipe. And the soup? Strange, but it really is better with than without. There’s one other change I made to the recipe, which is admittedly bizarre. I “ripped it off” from the classic Bolognese. When nearly done, I add about a half cup of milk, stir it in and let the Sloppy Joes reduce down a few more minutes. You’ll have to trust me, but it’s magic. 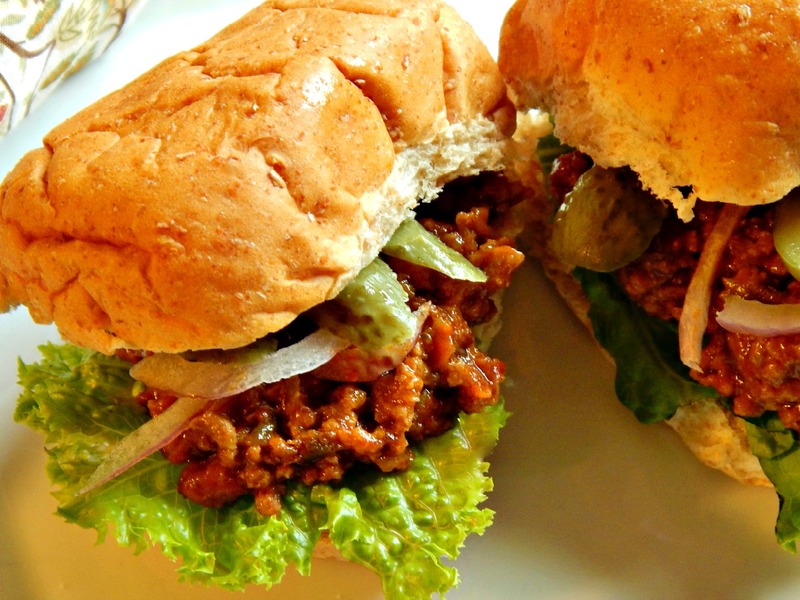 No one will guess why your Sloppy Joes are the best in the world, although this is optional. The recipe can be cut in half, but why not do what I call “a double down” and serve half and stash the rest in the freezer for another time? Unless. of course, you’re serving a crowd. Serve on buns (I often cut “dinner” rolls in half rather than using hamburger buns and make sliders – they’re so fun) with dill pickles. Cole-slaw is the classic accompaniment. I think you’ll find pricing (about $12.70 for this large amount) comes out pretty well per meal or per serving. For a gathering, compared to something like a hamburger, especially the cheap, yet somehow expensive (per pound) pre-made ones, the pricing looks even better – and your guests will likely appreciate a great Sloppy Joe over a crappy burger! The Walmart special: 4 ounce burger for 70 cents. Sloppy Joes, 50 cents a serving with careful shopping. Try using a scoop as the serving implement and you’ll find everyone will automatically have to portion and there’ll be far less mess. In a large saucepan or Dutch oven, cook beef and onion over medium heat until meat is no longer pink. Drain thoroughly. Return ground beef to pan, add green pepper and the rest of the ingredients. Bring to a boil. Reduce heat; cover, leaving lid slightly ajar and simmer very slowly for one hour, stirring occasionally, especially towards the end. Sloppy Joes are finished when this becomes one cohesive mixture with no juices separating out. If desired, when finished, add 1/2 cup of milk and slowly reduce until the mixture is finished, again. Taste and adjust seasonings. Serve on buns with dill pickles. Read Strategies Applied additional tips as well as throughout the recipe, for saving time and managing food. Feel free to omit milk. Adjust spices and seasoning to your taste. Up the heat level if serving adults. More chili powder, a bit of cayenne, perhaps some hot sauce or jalapeno juice. Hot peppers may be added with the Bell Peppers. If you’re adventurous, a glug or two of beer gives an interesting flavor. Did you know a potato masher makes short work of breaking down hamburger or ground beef as it fries? It also mashes Avocado perfectly for Guacamole. Breaks down apples for applesauce or other chunky fruit. Makes excellent crash potatoes, too. Scoops perfectly portion – which really helps when you have those in your family that just go crazy on stuff. This entry was posted in Click here for Bargain Meals, Click here for Fabulous Food Posts and tagged Bell Peppers, Carrots, Easy Recipe, Family Recipe, Freezes Well, Frugal Hausfrau, Ground Beef, Heritage Recipe, Sloppy Joes, Tomatoes. Bookmark the permalink. I often think about the health factor on “heritage recipes” (love the term!) I know a lot of them don’t meet the current standard of healthy, but I also think that the act of cooking puts you way ahead of pre-packaged or restaurant foods. Plus, with all of the veggies in this, it looks like a great way to sneak in extra veg. Those are really good points. It’s all relative, isn’t it? Another plus of eating at home is that you have total control over what goes with it, while it you have something like this at a restaurant or diner, you just know it will be half a plate of fries or chips! To tell ya the truth, when I eat out it’s hard NOT to get the fries or chips (and a pop) even when there ARE other options! I think of these as *stealth* veggies – if they’re chopped up fine they just melt in and no one knows they’re there!